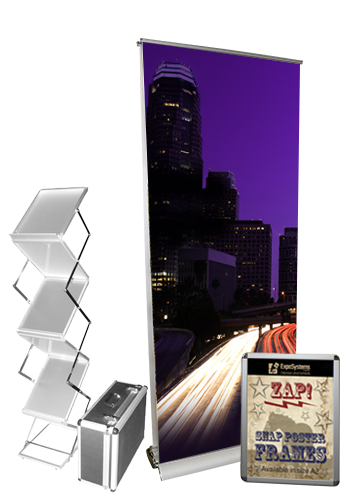 ExpoSystems USA offers a line of commodity products that are affordable while bringing back a personal touch of customer service allowing you to meet any client demands on and off the tradeshow floor. "Making YOU Stand Out" is not only our mantra but a desire to help you remain distinctive in your markets and your industry. We have over 40 years in the tradeshow industry. We are a manufacturer and consequently we can respond to anyone's needs quickly, efficiently and completely. ExpoSystems USA is proud to announce its partnership with Display Graphic Systems in Chicago, IL. Together the two companies will uniquely provide the Exhibit and Display industry with superior products, personal customer service and a warranty guarantee that surpasses any other exhibit manufacturer. When we say Lifetime Warranty, we mean it! We will repair or replace your products should you ever have an issue. ExpoSystems welcomes the opportunity for distributors and resellers to take advantage of our monthly specials, rewards program and Facebook Friends Contest where you can be a “winner” each month.